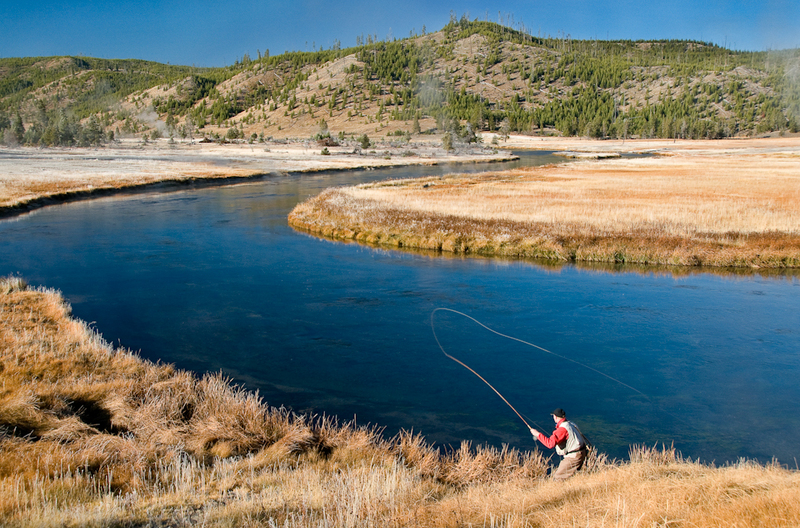 Near the end of last year’s Yellowstone Park fishing season I received an email from Bill M., a longtime Yellowstone angler, detailing some difficulties he’d had on a recent trip to the Firehole River. He asked if I could provide any insights regarding his experience, such that his luck might be improved in the future. His problems involved White Miller (Nectopsyche sp.) caddis, and his description of events will be familiar to many anglers. I told him I’d be happy to share my thoughts. Here’s what Bill had to say: “I enjoyed (?) an incredibly frustrating time on the Firehole just downstream of the Ojo Caliente parking lot the first Saturday in October. The day was bright. I arrived about 4:00 and saw only an occasional rise. I crossed and fished downstream for a while, catching one smallish (but fat) rainbow on a white miller soft hackle. I re-crossed and walked up almost to the bend when suddenly the air was filled with caddis and trout began rising everywhere–small ones becoming airborne, which usually means emerging caddis. Over the next 90 minutes or so, I seined three times (not much in the drift–a few baetis spinners, and I suspect the caddis were coming up rapidly and wouldn’t be in the drift), and I tried an X-caddis, an iris, a soft hackle, and combinations of the three (all BRF white miller patterns, although I also tried an iris in a larger size). I dead drifted, I skated, I waked, I cast downstream with dead drift or hang-on-and-wait. I did not even get a false rise. As the blood moon rose and the sun set (utterly gorgeous with buffalo heading into the timber), I left thoroughly befuddled, particularly since I had experienced a banner late afternoon/evening at the same place one year earlier. I stopped in at the shop next morning, and Bucky said the trout have required a skated white miller. Maybe my skating technique wasn’t good enough. At any rate, as you are considering upcoming blog posts, either on the BRF site or your own, I’d love to read what you’ve discovered”. An important key to White Miller fishing is understanding that swarming activity and emergence often occur simultaneously. Fish feed avidly on both stages, but rarely at the same time. Bill noticed small fish leaping from the water, a behavior which frequently indicates a caddis emergence. But that observation alone isn’t enough. We need to know if those fish were actually chasing the fluttering adults, or if their leaps were the energetic byproduct of taking pupae in the film. Close observation of individual fish can determine this. My speculation is that since only small fish were jumping, yet the river was alive with risers, that an emergence was taking place coincidental with the swarming activity. 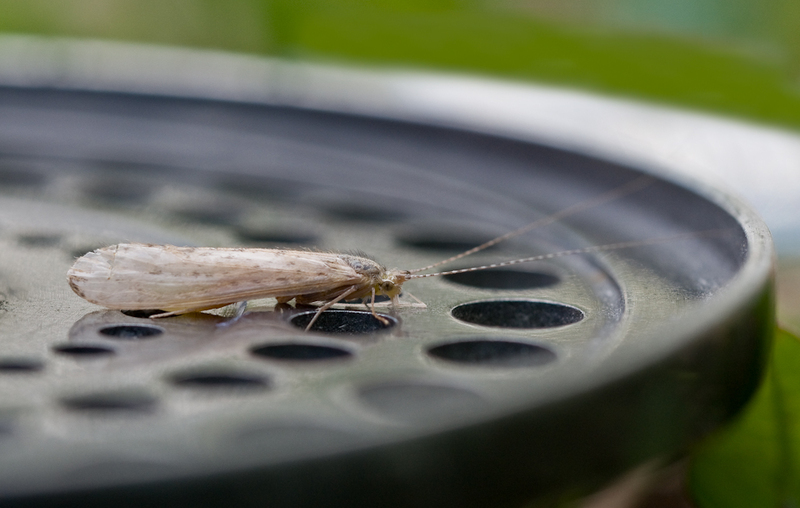 (That Bill’s seining efforts revealed no caddis isn’t a surprise. Caddis are notoriously quick to leave the water upon emergence, and are extremely difficult to catch in a seine.) If the fish had been truly keyed in on the fluttering adults, Bill would have seen fish of all sizes jumping for them, and jumping often. Considering all this, I’d begin fishing with an emerger pattern. A good choice would be an Iris caddis. It’s not the only fly that works, but it’s the best that I’ve found. I recommend a size #18. Yes, #18—not #14 or #16, even though those sizes better represent the adults. For those of you familiar with this hatch an #18 may seem oddly small, but in my experience it always out-produces larger imitations. Bill tells us that he tried an Iris caddis, but doesn’t mention in what size. Let’s assume for discussion’s sake that he did try a #18, and that it failed just as beautifully as all the other flies he used. What, then? Well, since fly pattern and presentation are always inextricably linked, let’s have a look at presentation. White Millers emerge in spurts. Which means the fish feed on them in spurts. For several minutes at a time, there will be fish rising everywhere. Suddenly the emergence ebbs, and only a stray rise is to be found here and there. Another spurt ensues, again the fish rise steadily, another ebb follows. And so it goes. 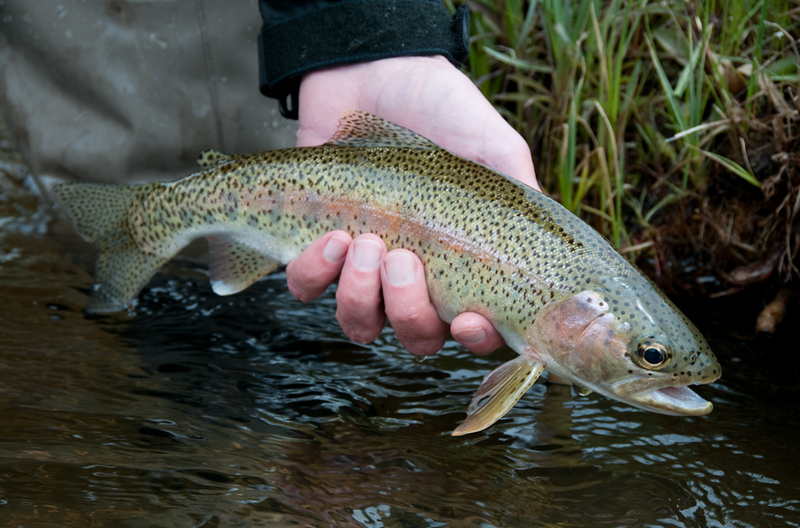 Peculiarly, Firehole trout are quite difficult to bring up during the lulls in emergence. So if you’re busy fishing in between these waves of caddis, success is almost certain to be negligible and random. (And you might think to change your fly, potentially replacing the right imitation with the wrong one.) Better to fish intently while the caddis are really coming, and relax a bit during the ebbs. Too, the conventional tenets of good presentation must always be honored: accurate, delicate casts delivered drag-free to individual fish. Take a pass on flock shooting, tempting as it may be. Understand also that your fly has competition for the trout’s attention. 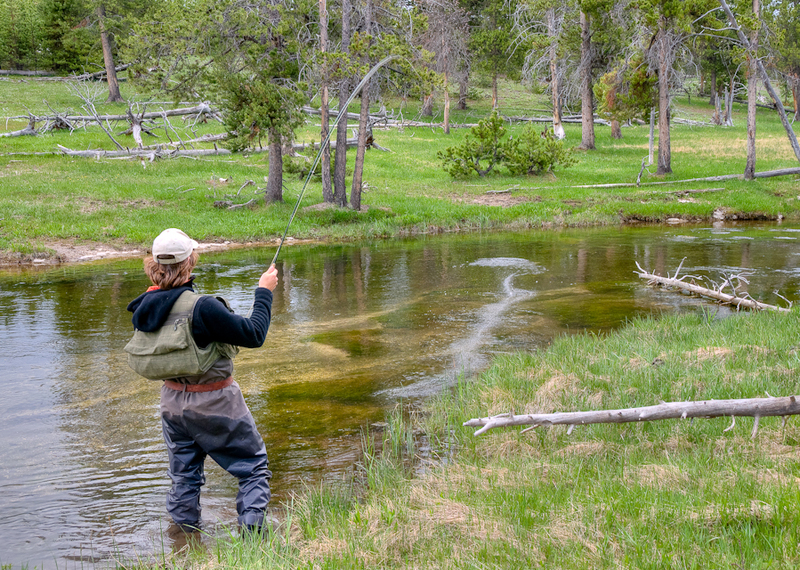 When a wave of Miller’s emerges they’re plentiful, and it could easily take a dozen casts before your fly is in the right place at the right time. Persistence pays off. Since I wasn’t alongside him that day, I can’t judge Bill’s presentation. We’ll never know if it was fly choice or presentation that sealed his fate. But I’m going to hazard a guess, hopeful that it might help. I’ve watched a lot of anglers fish this hatch over the years, and when they’ve struggled the reason has almost always been faulty presentation. I suspect that was Bill’s problem too. I’m sure he made some accurate, drag-free casts with his Iris caddis. But did he make enough of them, over a single fish, at just the right moments to effectively compete with a horde of emerging naturals? Or was he too quick to fault his fly, changing it unnecessarily? If it was the latter, he wouldn’t be alone. Most anglers, having their first few casts go unacknowledged by a rising fish, either move on to a different fish or—more commonly, yet—a different fly. With this hatch, that’s not the path to prosperity. It’s not my intention to belittle Bill’s efforts. I know he fished hard. So if this emphasis on the details of presentation seems a tad pedantic, it’s only because Firehole trout can be such stern taskmasters. As Bill and I and many others have found out, when those browns and rainbows get locked in on a Miller emergence, especially the larger fish, they’re awfully tough to catch. But tough doesn’t mean impossible. Not when we understand how the hatch works, what constitutes effective presentation, and we resolve to make good on both.